Dan passed on November 15, 2018, at the age of 74 in Pittsburgh. He was born August 22, 1944, in Tucson Arizona and currently was a resident of Erlanger Kentucky. He was the husband of the late Beverly Bracken Robles. 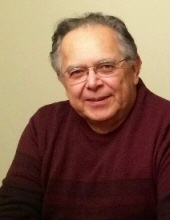 Dan is survived by his son Daniel W. Robles and his wife Debbie; A brother Alfred (Holly) Robles and grandchildren Rebecca, Jessica and Danny Robles. Dan enjoyed spending time with family, watching sports and golfing. He was a graduate of the University of Arizona. The family held a small private service to say goodbye. Donations can be made to the American Heart Association at the link listed below. "Email Address" would like to share the life celebration of Daniel B. Robles. Click on the "link" to go to share a favorite memory or leave a condolence message for the family.